Ever needed to manage multiple inventories? For example, you have two actors in your game, but they are in two different locations. To make this more realistic, you would like each actor to have their own inventories, such as their own weapons, armors, items, and gold. This plugin provides functionality that will allow you to manage your inventories using events. When you’re switching between actors during your game, you can also switch the current active inventory, and the game will handle all of it for you. Do your actors come together later on? You can also merge their inventories together with a simple command. Download the plugin and place it in the “plugins” folder in your project’s “js” folder. Then open your Plugin Manager (F10), double-click an empty row, and select the MultipleInventories plugin. This plugin uses “names” for each inventory. Let me explain what an inventory “name” is. And so on. You are free to choose any name as long as it doesn’t contain a space. However, you must also ensure you are consistent with things like upper-case/lower-case and so on. In the plugin manager, you have the ability to set a “default” inventory name. This is the name of the inventory that will be used when the game begins. It is not necessary to set this: you can simply switch inventories at the start of the game if you wish to use a specific name. However, you have the option to do so. Where the NAME is the name of the inventory that you would like to switch with. Here is an example from the video that shows me switching to a second actor, and switching the inventory as necessary. Where NAME1 and NAME2 are the names of the inventories that you want to merge. Here is an example from the video that shows both actors joining together and, consequently, merging inventories. 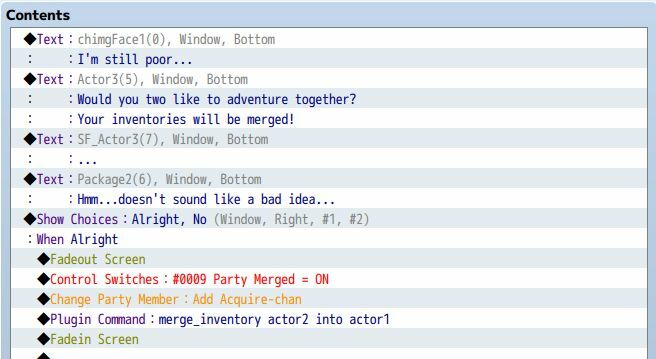 Please note the word “into”: when you merge inventories, you are literally merging NAME1 into NAME2. NAME1 will then be deleted, and you are left with only NAME2. You will run into problems if you try to merge your current inventory into another inventory, so always make sure your current inventory is NAME2. I would like to use this plugin for a game I’m making for an event. How do I get proper credentials for it? I do the switch for a team and i switch to another inventory and i switch to an other inventory and my inventory don’t work . First, this plugin is awesome. I love it. However, I have a question, I plan to change inventory when I change the leader of party, I successfully did part of it , but I need to close the menu and reopen to change the inventory. Is there any way to activate it during menu? Just like the “Global Common Events” you made for another version can just fix my problem( but I’m using MV). hey, first of all this plugin is an amazing idea to begin with, but is it also possible to send specific items from one inventory to the other instead of just merging? I’m having some trouble with this script. I can’t seem to create the second inventory correctly and keep getting a typeError: cannot read property ‘undefined’ of undefined. Are my other scripts causing this error or am I missing something when creating the second inventory. How are you creating the second inventory? See if the error occurs when you disable all other plugins. I’ve tried turning off all other plugins and the error still occurs. Are there other ways to set up a new inventory? No, I made it so that switching to an inventory automatically creates the inventory if it does not exist. I just tested it in a new project and I can switch inventories without an issue. If you’ve disabled every other plugin and it still doesn’t work, I’ll have to see how it is set up. It seems when playtesting from a previous save file from before I had added the plugin. When I played the game from a new game the plugin worked perfectly! Thank you so much for you help! Second, are you interested in listing plugins adding functionality to or based on your own plugins for MV plugins, like you did with some VX Ace scripts? I am deprecating multiple inventories in favor of my new Inventory Core system, which will provide support for multiple inventories along with other inventory functionality. I would highly recommend taking a look at it instead. It builds on the idea of having an object to represent the inventory, but this time it’s a full-blown class. The default inventory is just a bunch of individual properties in Game_Party. If you look up initAllItems you can see how it’s defined. It makes it difficult to write modular code because you wouldn’t be able to just take a nice “inventory” object as the parameter, which is why I decided to go with the new inventory system even if it will likely break compatibility with existing inventory plugins. Yes, I also post up plugins that others have written that will add functionality to any of my own plugins. Yeah, that’s what I found. I tried to construct an equivalent thing but I ran into something that seems to be an iteration issue with the default inventory’s armor in inventory, for example. That or it didn’t track item amounts the same way. Inventory Core looks good. As far as I can tell it’s the same structure Multiple Inventories uses, which means what I’ve written may only need to be changed to cope with getting at Game_Inventory and the various things under Game_Inventory. I’ll let you know how it goes there, I guess; thanks for the heads up. Oh my god, this plugin is a lifesaver. I was starting to panic that there wasn’t something like this available for MV yet which would make my game’s story impossible. Thank you so much! Glad this helps! If you can write an article about how you’re using this plugin your own project I can include a link to it in the post for others to read! Should players be able to do anything when the box is hidden? -No. What happens if I press a key that is not the toggle button, when the message box is hidden? -Nothing happen, or the message box show up. What if I want to skip the scene while the message box is hidden? -No. This will be awesome if you can hide battle menu boxes during chars/enemy skill animation. Thank you very much for your hard work. I appreciate your help. Let me think about how that might be implemented. Thank you so very, VERY much for this! I wasn’t sure whether to buy MV or not but your efforts and Yanfly’s are most appreciated and basically made me have no regrets buying it. Love your work, keep it up! hi just wanted to know can this be used to allow every party member to have their own bag perse? No, this plugin just gives the party more inventories. Actor inventories will need to be implemented a different way. Do you know to implement actor inventories? Omg!! Do you have party-manager coming up!?! I really cant wait! Thank you Hime!! Hime, I love you for this. I have a WIP game from Ace that I’m trying to remake and continue on MV that used your Ace script for this. I was pulling my hair out trying to figure out how to do this manually, since this script wasn’t around for MV yet and possible never would have been. If you have anything else you need just let me know and I can look into it.